my name is Mirko, I work in an italian ISP, we have some mail servers which are used by our customers to relay thei messages. Since last week we got reports of email blocked by ESET Mail Security, for the reason: IP 213.178.196.125) found on cloud black list. We monitor our servers blacklist status and it seems this server is not in any major blacklist. Could you please give us more info in order to get delisted? I filed a listing dispute on your behalf, the team responsible will check it. I checked the listing today and the IP 213.178.196.125 was not found on any of used by us. Can you confirm, that the issue is resolved and the messages are arriving as they should? Unfortunately we st ill get rejected. can you please provide me with few exported samples of the rejected messages? Also provide me with with appropriate records from the spam log. You can send them to my by means of a private message with a reference to this forum topic. Eset appears to be blocking inbound mail from "mailer01.telemar.org." 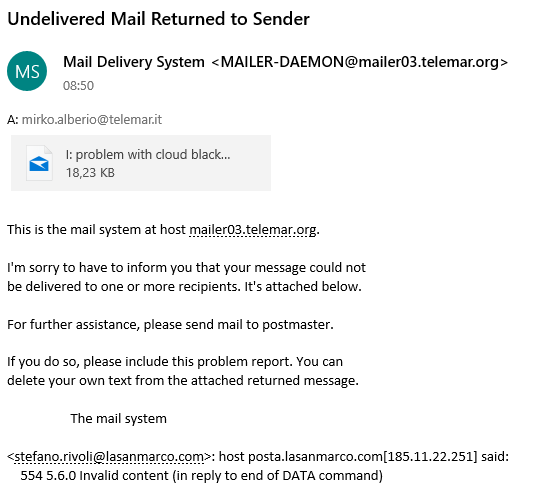 Note that the posted rejection notice from telemar.org states "This is the mail system at mailer03.telemar.org." Perhaps this is some type of domain routing issue?